The deal calls for satellites to be launched on Relativity’s yet-to-be-flown Terran 1 rocket, starting no earlier than 2021. For proprietary reasons, Ellis couldn’t provide other details, such as the exact number of launches covered by the deal, the contract’s dollar value or even where the launches would be conducted. He did say the deal has been in the works since 2016, when Relativity Space had only seven people on its payroll. Now the company employs 80 people, and an average of two employees are being added every week, he said. Today’s announcement comes a little more than two months after Telesat and Blue Origin announced a separate deal for multiple satellite launches on Blue Origin’s yet-to-be-built New Glenn rocket, also targeted for the 2021-or-later time frame. Telesat launched its first low-Earth-orbit broadband satellite last year — and eventually plans to build up a constellation in low Earth orbit, or LEO, comprising hundreds of satellites designed to provide global broadband services. “We’re really excited to join the ranks of Telesat and Blue Origin to be able to support this constellation,” Ellis said. Telesat’s chief technical officer, Dave Wending, praised Relativity Space for applying 3-D printing technology to the manufacture of rocket components. 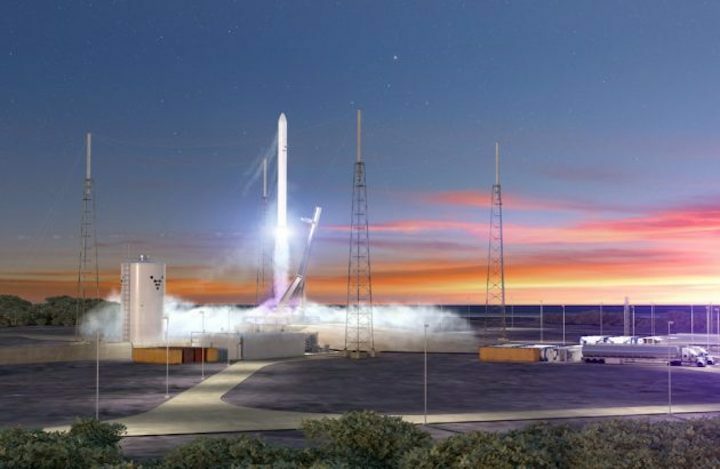 Ellis said Relativity Space is on track to conduct its first orbital test launch from Launch Complex 16 at Cape Canaveral Air Force Station in Florida by the end of 2020. In addition to the Florida launch facility, the company has its headquarters and rocket factory in Los Angeles, featuring a room-sized, robotic 3-D printer called Stargate. The L.A. operation is expected to relocate to a bigger facility this year. Relativity makes use of facilities at NASA’s Stennis Space Center in Mississippi to test its 3-D-printed Aeon 1 rocket engine, and it’s currently looking for a West Coast launch site. Although Ellis didn’t say so, Vandenberg Air Force Base seems to be the likeliest spot. And for what it’s worth, Blue Origin is planning to develop a launch site at Vandenberg as well. All these expansion plans are expected to boost Relativity’s infrastructure footprint to more than 350,000 square feet by the end of the year. Telesat is by no means the only satellite venture targeting the global broadband market: SpaceX and OneWeb are also planning large satellite constellations, and this week, Amazon said it would join the fray. There’s a chance that Relativity Space could get some of that business as well. After all, Blue Origin already has a launch contract from OneWeb, and because of the Bezos connection, it’s sure to be in the running for Amazon’s business as well. Ellis has fond memories of his days at Blue Origin, and although Relativity Space’s headquarters is now firmly settled in Los Angeles, he said a Seattle office could well be part of the company’s long-range plan. “It’s still always in the back of our minds,” Ellis said.